Abstract: The intermodal hinterland transportation of maritime containers is under pressure from port authorities and shippers to achieve a more integrated, efficient network operation. Current efforts for improving this have yielded limited results, though, as the transportation product structure limits the flexibility of transportation providers to optimise network logistics. Synchromodality aims to overcome this by a new product structure based on differentiation in price and lead time. Each product is considered as a fare class with a related service level, allowing to target different customer segments and to use revenue management for maximising revenue. However, higher priced fare classes come with tighter planning restrictions and must be carefully balanced with lower priced fare classes to match available capacity and optimise network utilisation. Based on the developments of intermodal networks in North West European, such as the network of European Gateway Services, the Cargo Fare Class Mix problem is proposed. Its purpose is to set limits for each fare class at a tactical level, such that the expected revenue is maximised, considering the available capacity at the operational level. Setting limits at the tactical level is important, as it reflects the necessity of long-term agreements between the transportation provider and its customers. Previous fare class mix problems did not take this into account. 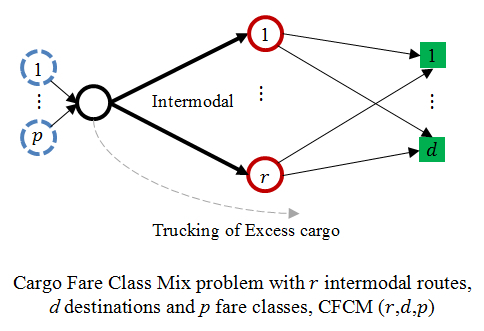 A solution method for the Cargo Fare Class Mix problem for an intermodal corridor is proposed, considering a single intermodal connection towards a region with multiple destinations. The main purpose of the article is to show how tactical limits for differentiated fare classes can significantly increase revenue compared to alternative approaches. Reference: B. van Riessen, R.R. Negenborn, R. Dekker. The cargo fare class mix problem for an intermodal corridor - Revenue management in synchromodal container transportation. Flexible Services and Manufacturing Journal, vol. 29, no. 3-4, pp. 634-658, December 2017. Published online: 16 March 2017.